How can mainstream Western social work learn from and in turn help advance indigenous practice? 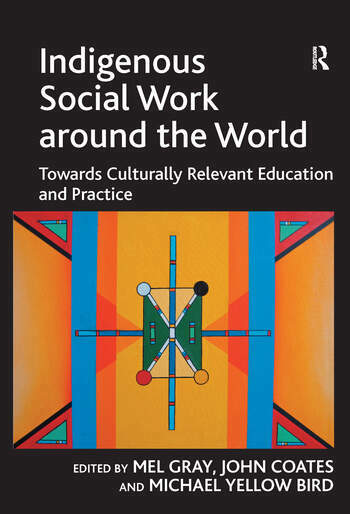 This volume brings together prominent international scholars involved in both Western and indigenous social work across the globe - including James Midgley, Linda Briskman, Alean Al-Krenawi and John R. Graham - to discuss some of the most significant global trends and issues relating to indigenous and cross-cultural social work. The contributors identify ways in which indigenization is shaping professional social work practice and education, and examine how social work can better address diversity in international exchanges and cross-cultural issues within and between countries. Key theoretical, methodological and service issues and challenges in the indigenization of social work are reviewed, including the way in which adaptation can lead to more effective practices within indigenous communities and emerging economies, and how adaptation can provide greater insight into cross-cultural understanding and practice. Contents: Preface; Introduction, Mel Gray, John Coates and Michael Yellow Bird; Part1 'Indigenization' as an Outmoded Concept: From 'indigenization' to cultural relevance, Mel Gray and John Coates; Promoting reciprocal international social work exchanges: professional imperialism revisited, James Midgley. Part 2 Indigenous Social Work: A Just Cause: Towards an understanding of indigenous social work, Mel Gray, Michael Yellow Bird and John Coates; Indigenous people and the language of social work, Michael Yellow Bird and Mel Gray; Indigenous social work in the United States: reflections on Indian tacos, Trojan horses, and canoes filled with indigenous revolutionaries, Hilary N. Weaver; Decolonizing social work in Australia: prospect or illusion, Linda Briskman. Part 3 Towards Culturally Relevant Social Work Practice: The development of culturally appropriate social work practice in Sarawak, Malaysia, Ling How Kee; The past, the present and the future: the New Zealand indigenous experience of social work, Wheturangi Walsh-Tapiata; Tongan social work practice, Tracie Mafile'o; Critical reflections on an Aboriginal; approach to helping, Michael Anthony Hart; Homemade social work: the 2-way transfer of social work practice knowledge between India and the USA, Jayashree Nimmagadda and Diane R. Martell; Localizing social work with Bedouin-Arab communities in Israel: limitations and possibilities, Alean Al-Krenawi and John R. Graham. Part 4 Culturally Relevant Social Work Education: Reconfiguring 'Chineseness' in the international discourse on social work in China, Rick Sin; A journey of a thousand miles begins with one step: the development of culturally relevant social work education and fieldwork practice in China, Angelina Yuen-Tsang and Ben Ku; Re-envisioning indigenization: when bentuhuade and bentude social work intersect in China, Miu Chung Yan and A Ka Tat Tsang; Developing culturally relevant social work education in Africa: the case of Botswana, Kwaku Osei-Hwedie and Morena J. Rankopo; Missing the 'flight from responsibility': tales from a non-indigenous educator pursuing spaces for social work education relevant to indigenous Australians, Susan Gair; Picking up what was left by the trail: the emerging spirit of Aboriginal education in Canada, Gord Bruyere; Indigenous social work education: a project for all of us?, Erika Faith; Hearing indigenous and local voices in mainstream social work, Mel Gray, John Coates and Tiani Hetherington; Conclusion, Mel Gray and John Coates; Postscript: terms of endearment: a brief dictionary for decolonizing social work with indigenous peoples, Michael Yellow Bird; References; Index.